Overall, STEM occupations accounted for 6.1 percent of wage and salary jobs in 2016, however the overall rate is not reflective of the differences in STEM concentration when industries are split into goods-producing industries and service-providing industries. This analysis differs from the previous analysis by recognizing this difference and treating goods-producing and service-providing industries separately. The STEM share for all service-providing industries is 5.9 percent, but in goods-producing industries, a noticeably higher 7.4 percentage of workers was employed in STEM occupations. This analysis identifies individual goods-producing industries that had a STEM share at least 2–1/2 times the national average for all goods-producing industries (greater than 18.5 percent) and service-providing industries that had a STEM share at least 2–1/2 times the average for all service-providing industries (greater than 14.7 percent). Once high-tech goods-producing and service-providing industries are identified, this study explores how high-tech industries affect the U.S. economy, such as the number of wage and salary jobs provided by high-tech industries, and the value of high-tech goods and services produced as measured by output. This analysis uses the 200 industry sectors for which BLS produces projections of industry output and employment.4 Using this set of industries allows for analysis of both historical and projected employment and output data. Table 1 shows the 27 industries identified as high-tech. Thirteen are goods-producing industries, which tend to have higher concentrations of engineers. Fourteen are service-providing industries, which tend to have higher concentrations of computer and mathematical occupations. Note: Output data is represented in nominal dollars. 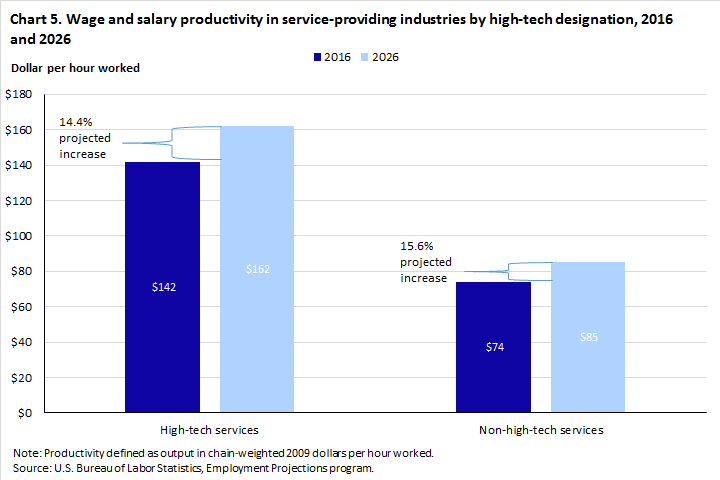 Median wages are higher in high-tech industries than they are in non-high-tech industries, but because STEM workers tend to have higher salaries and are (by definition) more prevalent in high-tech industries, this general trend is expected due to compositional effects. However, a comparison of wages by occupational group shows that workers of all types, not just STEM workers, had higher wages in high-tech industries. (See table 2.) In fact, every major occupational group had higher median wages in high-tech industries than in non-high-tech industries. Note: Wage data cover non-farm wage and salary workers and do not cover household workers. Source: U.S. Bureau of Labor Statistics, Employment Projections program, and Occupational Employment Statistics program. Compositional effects could be in play within major occupational groups; for example, most sales workers in high-tech industries are employed as sales representatives and sales engineers, but most sales workers in non-high-tech industries are employed as cashiers and retail salespersons—jobs that have lower education and training requirements, and consequently lower wages. Examining the data for detailed occupations shows that the pattern of higher wages in high-tech industries still holds. Table 3 shows the median annual wages for the 20 occupations with the largest employment in high-tech industries, a selection of occupations that spans multiple occupational groups and levels of education and training. For every occupation in table 3, wages were higher in high-tech industries than non-high-tech industries. High-tech industries accounted for 14.5 million jobs and about 9.9 percent of total wage and salary employment in 2016. (See chart 1.) 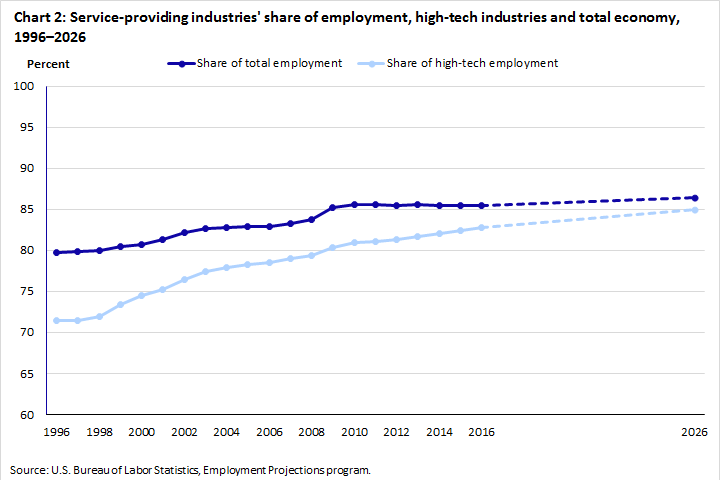 Between 1996 and 2016, the share of employment in high-tech industries stayed within a narrow range of 9.2 percent to 10.1 percent. Notable during this period was the impact of the two recessions: the dot-com bubble (2001), and the Great Recession (December 2007–June 2009). High-tech employment fell from 13.5 million jobs in 2000, about 10.1 percent of all wage and salary jobs, to 12.3 million jobs in in 2003, about 9.3 percent of all wage and salary jobs. The high-tech sector was hit harder by the dot-com recession than other sectors of the economy. 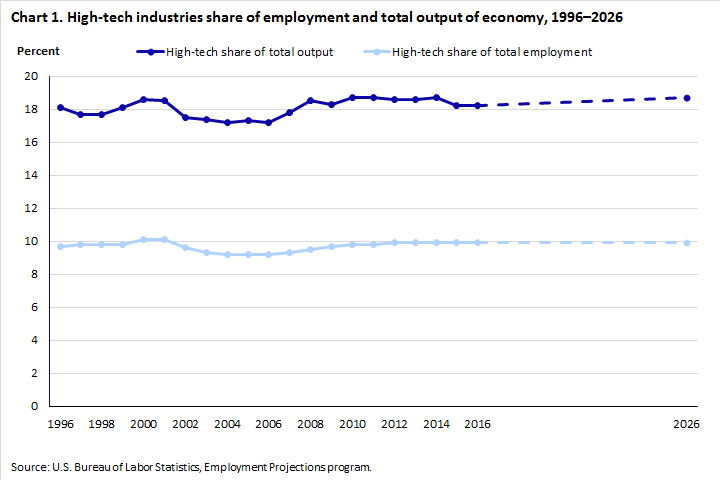 The high-tech sector did not surpass its 2000 employment levels until 2013, but non-high-tech industries had recovered from jobs losses sustained during the dot-com recession by 2004. During the Great Recession, however, the opposite trends played out: the high-tech sector’s share of total employment grew from 9.3 percent of jobs in 2007 to 9.8 percent in 2010, losing only 48,600 jobs, while the rest of economy lost almost 7.6 million jobs. By 2011, the high-tech sector had recovered all jobs lost during the recession, but non-high-tech industries did not surpass pre-recession employment levels until 2014. The high-tech sector produced $5.3 trillion of output in 2016, accounting for 18.2 percent of total output, down slightly from an all-time high of 18.7 percent in 2011. High-tech’s share of output endured an extended slump after the dot-com recession in 2001, with the share not exceeding 17.8 percent from 2002 to 2007 after peaking in 2000 at 18.6 percent. However, following the Great Recession, the share recovered and has remained above 18.1 percent since 2008. 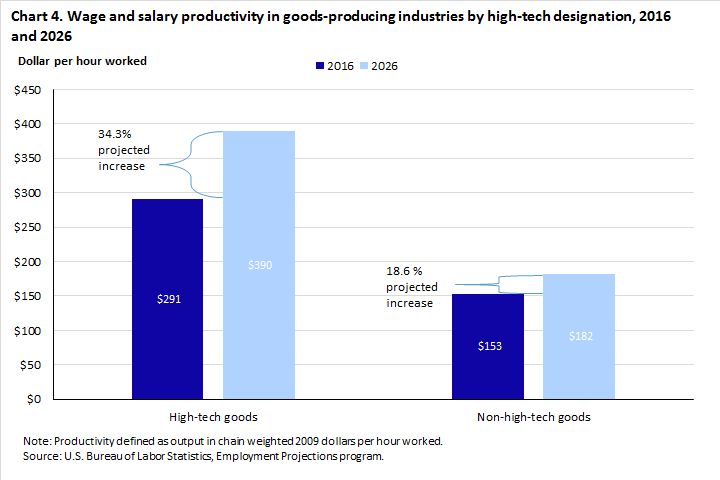 From 2016 to 2026, the high-tech sector is projected to gain 1.1 million jobs, maintaining its share of wage and salary employment at 9.9 percent. Output is projected to grow by $2.1 trillion, increasing its share of total output from 18.2 percent in 2016 to 18.7 percent in 2026. This employment trend is projected to continue, with service-providing industries’ share of high-tech employment projected to reach 85.0 percent in 2026. Service-providing industries share of output also reached an all-time high in 2016, accounting for 71.1 percent of high-tech output. 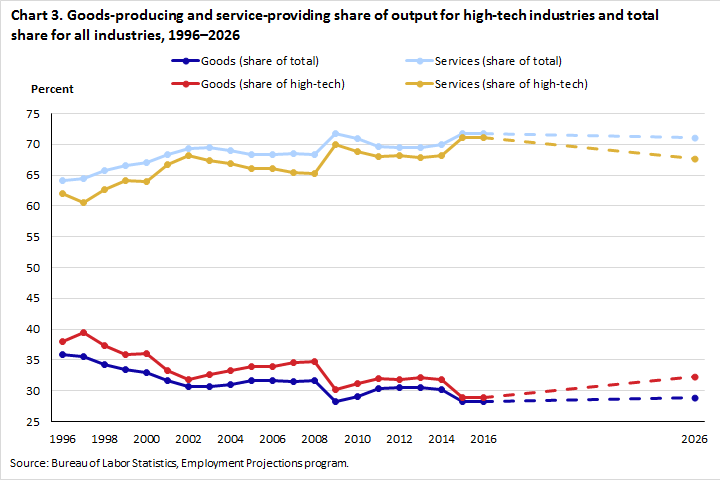 Similar to high-tech employment, high-tech output has steadily shifted towards service-providing industries over the years. (See chart 3.) However, goods-producing industries are projected to increase their share of high-tech output from 28.9 percent in 2016 to 32.3 percent in 2026, fueled in large part by increases in oil and gas extraction output. High-tech industries are an essential part of the U.S. economy, providing almost 10 percent of all jobs, but producing over 18 percent of output in 2016. This higher output per worker is reflected in wages, which are higher in high-tech industries for nearly every type of occupation. High-tech industries are projected to increase their share of total output through 2026, while maintaining their share of employment. Employment in the high-tech sector is projected to continue to shift towards service-providing industries over the next decade, from 82.8 percent of high-tech employment in 2016 to 85.0 percent in 2026. This Beyond the Numbers article was prepared by Brian Roberts and Michael Wolf, economists in the Office of Employment and Unemployment Statistics, U.S. Bureau of Labor Statistics. Email: roberts.brian@bls.gov, wolf.michael@bls.gov. Telephone: 202-691-5754, 202-691-5714.